WASHINGTON (CNS) — The work of researchers who reported detecting the signal left behind by the rapid expansion of space billions of years ago is rooted in the efforts of a Belgian priest whose mathematical computations in the 1920s laid the groundwork for the Big Bang theory. Msgr. George Lemaitre, a mathematician who studied alongside leading scientists of the first half of the 20th century exploring the origins of the universe, suggested that the cosmos began as a super-dense “primeval atom” that underwent some type of reaction that initiated the expansion of the universe which continues today. The priest’s conclusions challenged the conventional hypothesis proposed by luminaries such as Albert Einstein and Fred Hoyle that the universe was in a steady state. Researchers in cosmology over the decades refined Msgr. Lemaitre’s idea, leading to what became widely known as the Big Bang theory and later ideas that signs of the Big Bang can be detected. The most recent evidence supporting the Big Bang emerged March 17 when a team of scientists announced they detected polarization in light caused by primordial gravitational waves originating from the Big Bang. 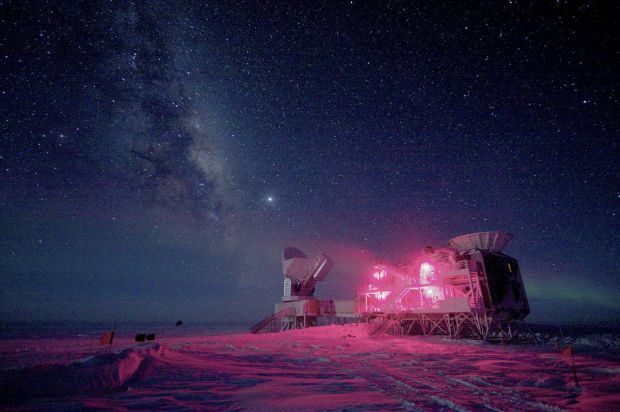 The measurements were made with the Background Imaging of Cosmic Extragalactic Polarization experiment, or Biceps2, located at near the South Pole. Scientists had theorized that such waves would have been produced in the universe’s first trillionth of a trillionth of a trillionth of a second as it underwent an exponential expansion 13.8 billion years ago, sending ripples throughout the universe that can still be detected. Other research teams are seeking to confirm the findings. If the existence of gravitational waves is confirmed, it will provide the most direct evidence yet for the rapid expansion of space, also known as the theory of inflation, said Ronald Olowin, professor of astrophysics at St. Mary’s College of California. Inflation was proposed in 1980 by Massachusetts Institute of Technology physicist Alan Guth. In information provided by MIT, Guth described inflation as the “propulsion mechanism” that caused the universe to undergo tremendous expansion in a fraction of a second. The discovery also provides more evidence to support Einstein’s general theory of relativity and quantum mechanics governing motion in the universe, Olowin told Catholic News Service. Msgr. Lemaitre’s work focused on interpreting Einstein’s theory and analyzing measurements of galactic motion by astronomer Edwin Hubble. The priest’s computations pointed to a constantly expanding universe and by extrapolation backward to the primeval atom. The priest’s work has long been held in high regard by generations of scientists. Even Einstein, who at first was skeptical of the calculations, literally stood up and applauded Msgr. Lemaitre’s explanation of the origins of the universe during a series of seminars in California in 1933. Msgr. Lemaitre, who taught for most of his career at Catholic University of Louvain in Belgium, died June 22, 1966 at 71 knowing that he was on the right trail. He was told shortly before his death that scientists had measured the cosmic microwave background radiation. By the late 1990s, researchers also concluded that the universe was expanding at an increasing rate, which Msgr. Lemaitre’s computations had shown to be happening. Despite the scientific disagreements, Msgr. Lemaitre maintained warm friendships with his colleagues around the world, Farrell said. A more definitive challenge, however, arose as some in the scientific community believed Msgr. Lemaitre’s pursuits were religiously motivated in an attempt to identify a creation moment in line with Catholic teaching. Msgr. Lemaitre insisted there was neither a connection nor a conflict between his science and his Catholic faith. In response to a question about the connection of his work and his faith, Msgr. Lemaitre said that the Bible’s authors were “illuminated … on the question of salvation” and that “the idea that because they were right in their doctrine of immortality and salvation they must also be right on all other subjects is simply the fallacy of people who have an incomplete understanding of why the Bible was given at all,” according to a 1933 Literary Digest article quoted in Farrell’s book. Augustinian Father Allan Fitzgerald, director of the Augustinian Institute at Villanova University, told CNS there should be no conflict between faith and scientific discovery. He explained that St. Augustine expressed openness to truth wherever it could be found. “The sciences of our day are no less than being sources of truth than anything else. The sense Augustine brought to all of this was just don’t try to use this book called Genesis or book called the Bible as a way of embarrassing yourselves in front of scientists,” said Father Fitzgerald, who at one time pursued a career as a physicist. “Once (scientific discovery) reaches a state of true being, we can’t use the Bible to beat it back,” he said. Jesuit Father Gabriele Gionti, who studies quantum gravity at the Vatican Observatory, said that as a scientist he draws a distinction between the beginning of the universe and creation and finds no contradiction between religion and science. “Creation does not coincide with the beginning of our universe,” he explained. “I tend to separate theological terms from scientific terms. This discovery proves, quite clearly, that the human mind is able to find mathematical models, like cosmic inflation, which could describe quite accurately nature. “This is totally in agreement with the doctrine of ‘imago Dei,’ which says that God created human beings as God’s image and as such we are like God, capable of discovering the secrets of nature,” the Jesuit said. He expressed concern that the mainstream media continues to press the idea of conflict between science and religion. “A lot of people still don’t understand that the Big Bang theory is not threatening to Christian faith,” O’Keefe told CNS. Felicitaciones a los astrónomos jesuitas del Observatorio Vaticano para la investigación científica que tiene lugar en Castel Gandolfo y Arizona, que cerrar la brecha entre la ciencia y la fe real y nos muestran con su dedicación a la verdad, ya que puede ser tanto científicos como verdaderos cristianos. El tapiz cósmico maravilloso e inmenso que nos ayudó a entender y mostrar es una prueba tangible de la existencia de Dios, el Creador del cielo y de la tierra. Muchas gracias a aquellos que buscan las huellas de Dios en la Creación.